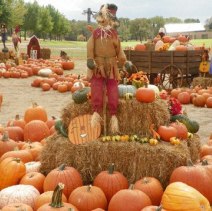 We have hundreds of pumpkins for you to buy, take home, or paint here! 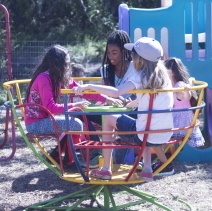 With your admission, enjoy many photo ops with scarecrows and farm decorations, a scenic hay ride, children's play areas, hay and haybale mazes, hay and tire climbing areas and more. 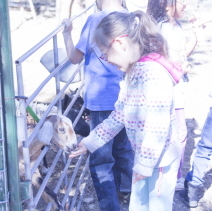 Also enjoy a live petting zoo and games. New this year, pig races, a big corn play box and a giant slide! There is a small fee for pony rides, a potato launch contest and face painting. 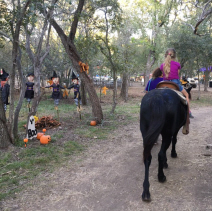 There is a free hay ride for you to enjoy through decorated woods and fields. We have refreshments available and shady sitting areas to enjoy them. 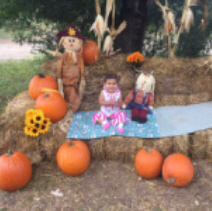 Enjoy some fun autumn farm time with your family and take home photos and great memories!